When you think of biscotti, you probably picture oblong, dry, flat-sided cookies that are commonly served with coffee or tea, with desserts or at coffee shops. 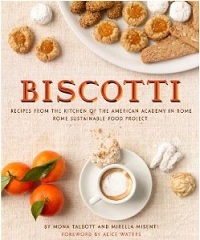 In Italy, the word is used to refer to any type of cookie – twice-baked or not – and in Biscotti: Recipes from the Kitchen of The American Academy in Rome, The Rome Sustainable Food Project they use the Italian definition. The book is put out by the The American Academy in Rome, the oldest American overseas center for studies in the arts and humanities. The food for the Academy is classic Italian, made with organic, locally produced food from the area surrounding the school. The baked goods served alongside that food are prepared with the same attention to tradition and quality ingredients. But the biscotti are a signature item, available every day and a favorite of students and visitors alike. The book is dedicated to these cookies. 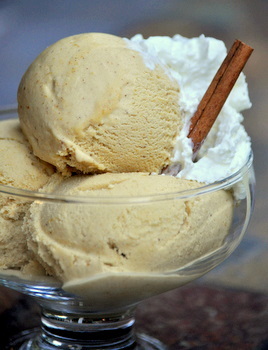 It is divided up into five categories: Milk and Wine; Nuts; Honey, Citrus and Spice; Meringue; and Chocolate. The recipes include very traditional Italian classics and twists on American favorites, such as snickerdoodles and peanut butter cookies, as they are prepared by the Italian kitchen in the school. The book has plenty of lovely photos of the cookies and is also peppered with snapshots of life at the Academy – literally, with photos of the campus and those who study there. The recipes are well written and most have few ingredients, something that allows their simple flavors to come through, as well as motivates you (the home baker!) 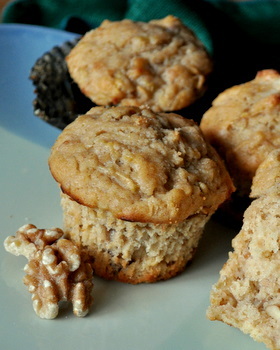 to try them out sooner rather than later in your own kitchen. The more traditional recipes are the main attraction here, and each of the recipes comes with some lovely notes about the origins of the cookies or the spices that give them their signature flavor, weather you’re baking a ring-shaped anise cookie (Ciambelline Elena) or a flourless pine mut cookie (Pinolate). Yes! When I was growing up, my grandmother always made huge batches of biscotti (like multiple sacks of flour huge) and they were the most delicious soft, round, anise-flavored cookies ever. She frosted them with a simple powdered sugar frosting, also anise flavored. These are biscotti to me. I’ve always been disappointed when I hear biscotti and then see those crunchy twice-baked things.